Heads Up! is a company designed to provide expert information and products for special needs children. Their items have been selected to accommodate various learning styles and strengths, regardless of curriculum used. These special needs products have been found to be especially helpful for children who are distractible or hyperactive. As part of the Homeschool Crew I received a variety of frames and readers from Heads Up! to use and review. Although none of our children have special needs these products have been helping us out too. For distractible or easily frustrated students, the frames and readers can be a helpful tool to focus a child's attention on the material that he is working on. McKenna has difficulty tracking the lines she is reading now that she is reading chapter books, and we keep one of the Heads Up! reader in her book so she can easily focus on one line at a time. The Heads Up! frames work great in helping a child stay focus on a specific section of his work, breaking it down into manageable areas so it does not seem overwhelming. There are two different sizes of frames and they come in a variety of colors. The smaller ones are great for drawing attention to just one problem at a time. The color contrast of the frame versus the text helps provide a contrast between the two areas. It's also much easier for a child to find his place if he looks away from the text. The Top of the Line reader and Heads Up! reader are my favorite items. 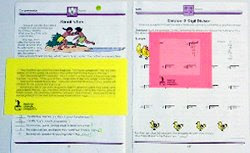 The Top of the Line has a highlighted strip along the top while the rest of the reader is opaque so that the child can not see through and be distracted by the rest of the text. 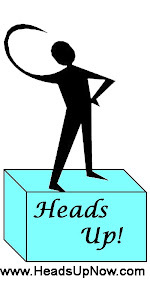 The Heads Up! reader has a thin highlighted strip between two solid strips of grey. Both work great to use as a bookmark and also double as a straight edge if text needs to be underlined. Best of all, the readers and frames have a great price tag making them very affordable. They are $1 each and available in your color choice. Heads Up! offers many other great products including books, games, and other educational helps - be sure to visit and see!